Resistance bands are ideal if you like to bring your workout with you while you're traveling, if you need support to train different exercises, or if you exercise at home. 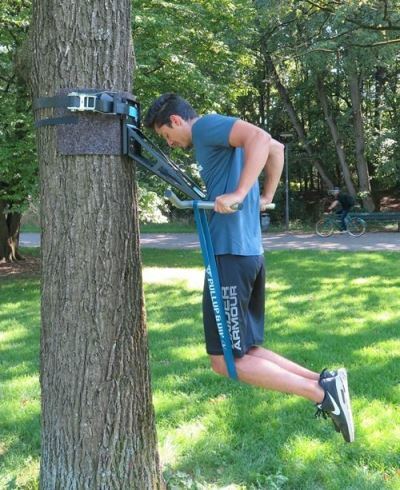 Not only are they extremely portable, easy to store and very lightweight, but a pull-up band also comes in multiple resistance levels and can be used with your Pullup & Dip bar for an effective full-body workout! While there are many exercises that you can do with a pull-up band, these five resistance band workouts will get you fit in no time. Pull-ups work your entire upper body, including your arms, shoulders and core. 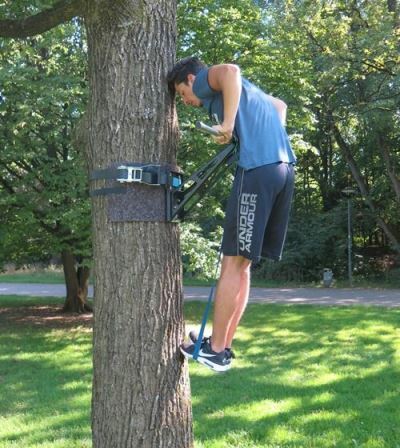 However, many people find a full pull-up difficult at first. 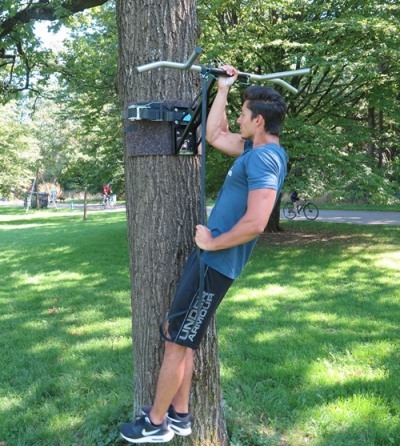 Adding a pull-up band to your pull-up bar can help you build the starting strength to do an unassisted pull-up! First, loop one end of your resistance band around your bar. Grab the bar with both hands and place either your knee or your foot in the band. The band now gives you support during the exercise. Complete the pull-ups like you normally do. The stronger the resistance band, the more assistance you'll receive when doing this workout. This exercise blasts your arms and shoulders. If you're not quite strong enough for a full bodyweight dip, incorporate a resistance band for an assisted dip. Loop each end of the resistance band around the dip bar handle on your Pullup & Dip. Get into the starting position of your dip with your arms fully extended. Place each knee against the resistance band and lower yourself into the dip position. Your arms should form a 90-degree angle before you push yourself back up into the starting position. The resistance band makes the bottom portion of the dip easier. As your shoulders and arms get stronger, use weaker and weaker resistance bands until you're able to do a full bodyweight dip. 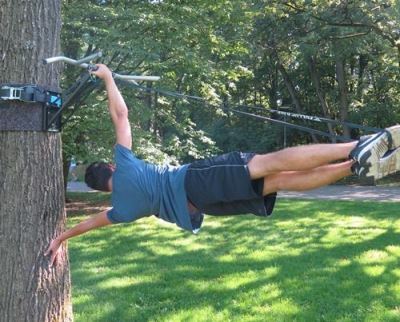 The human flag is one of the most effective core-stabilizing workouts and can help you to get a shredded, strong six pack and powerful chest. The goal of using resistance bands when learning the human flag is to build the muscles you need to do this workout unsupported. First, loop your resistance band around the top of your Pullup & Dip bar. 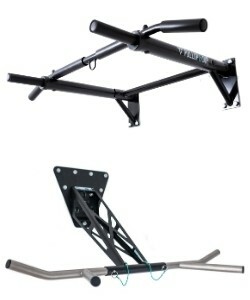 The bar should be hung next to a vertical pole, tree or wall rungs if your home gym has them. Hook one foot through the hanging end of the band. Then, get into the human flag position. Grasp the pole or wall runs with a true grip, then focus on pushing out your bottom shoulder while engaging and pulling down your upper shoulder. This rotates your body horizontally away from the pole with your chest rotating slightly upwards toward the ceiling. Keeping your core and chest strong, use those muscles (not your legs) to lift your legs off the ground so that your body is straight and perpendicular to the wall rungs or pole. Hold this position as long as you can. The resistance band looped around your foot can help you get into and stay in the human flag position longer. A band-assisted muscle up can help beginners through the hardest part of the muscle-up: the transition from the pull-up to the dip at the top of the exercise. 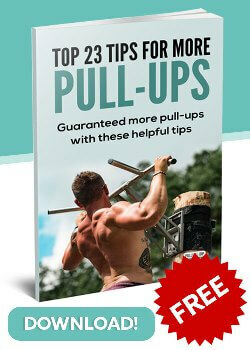 The muscle-up combines the effectiveness of the standard pull-up with a pushing movement that emphasizes your triceps. Loop your resistance band around the pullup bar. Start in a wide grip pull-up position and tuck your knees or feet into the band’s bottom loop. Pull yourself up towards the bar like you would in a pull-up. As you reach the top, pull your chest up over the bar then transition into pushing to straighten your arms until your waist is level with the Pullup & Dip. Pause, then lower yourself back down. The one arm pull-up is a very challenging exercise. Loop your resistance band around the pull-up bar. To perform this variation, grip the pull-bar with one hand only, pull your shoulder blade downwards to get in position. Then, bend your arm and pull yourself up while your other arm is pulling on the pull-up band. It helps to ‘push’ your other shoulder up to the point that you reach or pass the pull-bar.